Previously, we talked about the Mason Theodore Roosevelt. Today, we have another Roosevelt in mind. Franklin Delano, or FDR as he was commonly called, was born 24 years after his famous fifth cousin. In case you're confused about which common ancestors these two Roosevelts shared, they had the same great-great-great-great grandparents. FDR's wife Eleanor was coincidentally a fifth cousin as well, all having descended from Claes Martenszen van Rosenvelt, who was born in 1596. Although they weren’t close in age, FDR and Theodore did spend some considerable amount of time together. Franklin, particularly, displayed a great amount of interest in and affection for his cousin from a very young age. Theodore's life was a point of comparison for him; FDR even chose pince-nez over standard glasses when the time came. ability of his much-admired cousin, FDR’s positive traits shone brightly early on. After practicing law for several years, FDR ran for state senate in New York and won. During this time, he was a tireless defender of farmers and a staunch supporter of the people. His desire to be connected to the public never diminished and led to his famous nationwide radio broadcasts throughout the depression and WWII. 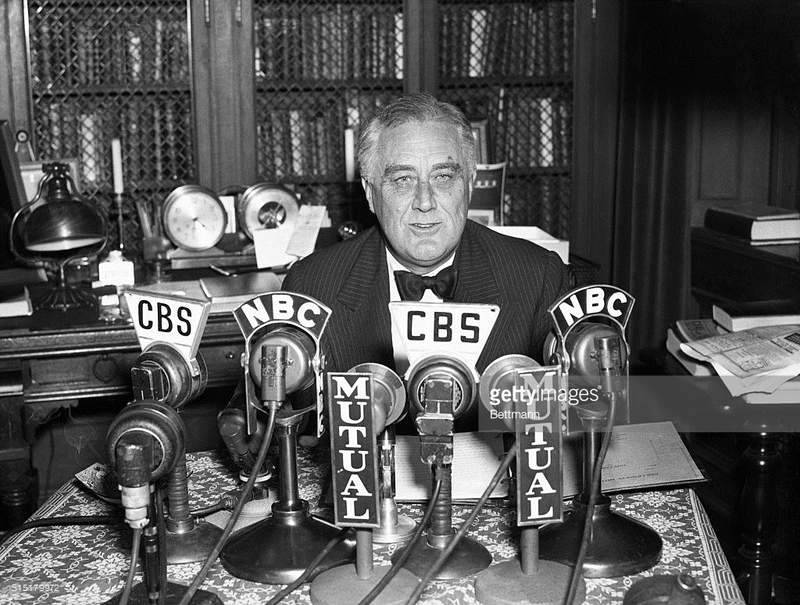 Between 1933 and 1944, he addressed the nation 30 times in what became known as the "fireside chats". 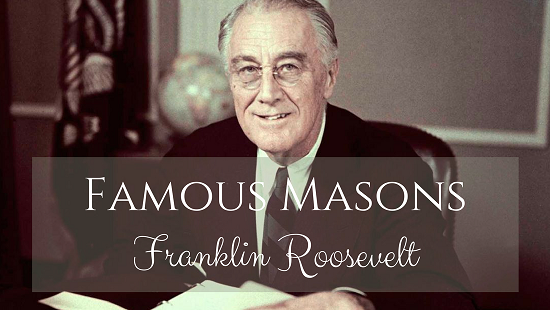 Before his political career took him to the White House, FDR was a highly active Mason who loved the camaraderie of the organization. He first joined the organization in 1911 in Holland Lodge, No. 8, New York City. He received his 32nd degree on February 28, 1929. Following his successful climb within the Mason ranks, he joined many social clubs affiliated with Freemasonry, becoming a Shriner in Cyrus Temple in 1930 and a Prophet at Sight in the Mystic Order Veiled Prophets of the Enchanted Realm. 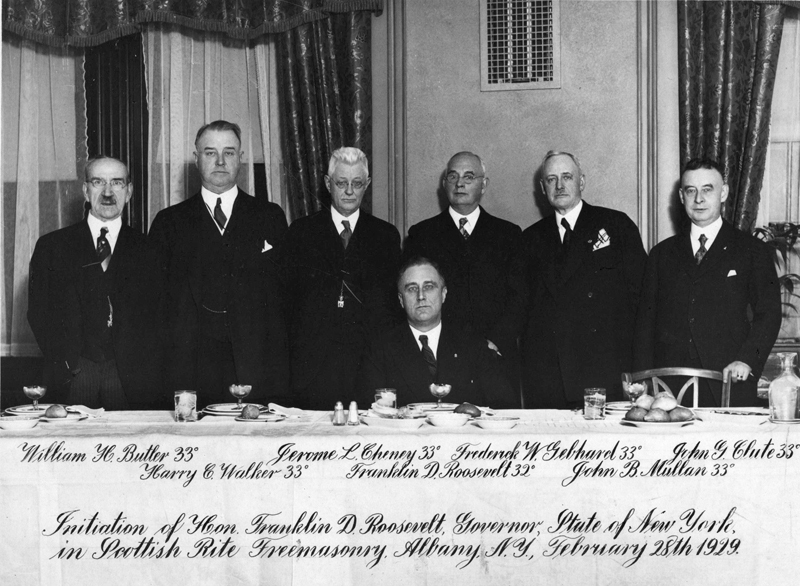 Although these organizations do not follow Freemason degrees and are mostly fun social clubs, FDR also held a number of honorary memberships within other Masonic lodges, including the Architect Lodge, No. 519 in New York. He spoke at many Mason events and press conferences and found Freemasonry to be a wonderful opportunity to connect with other people. In 1928, shortly before the start of the Great Depression, FDR was elected governor. As governor, he encouraged many unemployed families to start subsistence farms designed to grow enough food to sustain themselves independently. Of course, as the Depression continued, more and more American families were unable to make ends meet. To exacerbate this economic disaster, the Dust Bowl crisis soon followed, making it impossible for thousands of farmers across the Southern and Southwestern United States to survive. When FDR took the presidential office in 1933, 13 million Americans were unemployed and impoverished. Immediately following his initiation, FDR proposed nationwide programs to alleviate this joblessness. These included allowing deficits into the budget, adding additional money into circulation and making the hoarding of gold illegal. He also repealed prohibition. His nationwide radio addresses also began within his first 100 days in office. He knew that talking to the people directly would be the only way to win their trust. It worked: within a few days of massive bank closures all across the country, citizens began to redeposit their funds, which allowed banks to reopen. Not everyone responded as positively to FDR's radical new changes. Businessmen were wary in regards to his experimental tactics, and the Supreme Court justices had their share of doubts. But as expected, the people loved FDR and re-elected him in 1936. 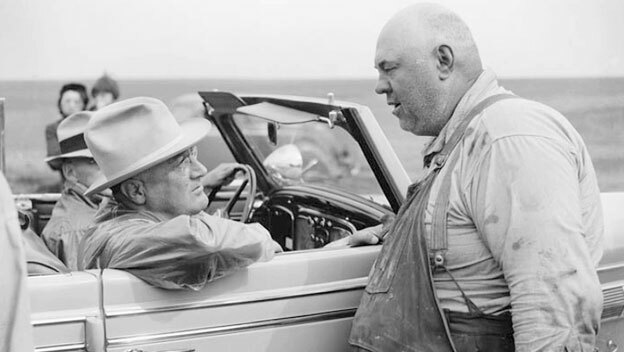 That summer, Roosevelt took a 4,000-mile train tour to investigate the Dust Bowl crisis himself. Farmers in the Dust Bowl were plagued by unyielding harvests, the result of bad farming techniques in a region not capable of sustaining crops, amid a nationwide economic depression. Although he did not have the answer to this farming crisis, he was greatly stricken by the plight of the people and promised to put major efforts toward a viable solution. the extent of this land mass - FDR proposed planting trees in order to prevent soil erosion and instituted a program to pay farmers for livestock which was doomed to die. FDR's secretary of agriculture, Henry Wallace, encouraged farmers to plant fewer crops and to change their plowing techniques in order to stabilize loose soils. It was the first time anyone had ever proposed that the Dust Bowl wasn't the result of poor weather patterns. In 1940, nearing the end of his two terms, FDR was far from satisfied with his accomplishments. With the Great Depression and the Dust Bowl behind him, Roosevelt began to acknowledge the war in Europe. Like Theodore, he wasn't a proponent of isolationism and favored military intervention. But until 1941, when the Japanese attacked Pearl Harbor, he kept with the policies set forth in the Monroe Doctrine. After the bombing, the U.S. was propelled headlong into World War II. For several years, Germany made enormous gains toward overthrowing Europe while, unbeknownst to most of the rest of the world, imprisoning and executing millions of innocent civilians, particularly Jews. Then, during their advances toward Russia, winter struck. An unprepared German army was halted, and the allies began to make noticeable gains. Working together with Russia to demand Germany's unconditional surrender, the war finally began to wind down in February of 1945. Amid the turn of the war tide, Roosevelt was reelected a 4th and final time. In April, less than four weeks before Germany's surrender to the Allies and Soviets, FDR suffered a massive cerebral hemorrhage and died. He was and continues to be the only president to serve more than two terms in presidential office, holding the position for 12 years and 39 days.